The Article that follows is from Elie Elhadj. M. Elhadj is a banker with 30 years of experience in New York, Philadelphia, London and Saudi Arabia. At age 54, he joined London University's School of Oriental and African Studies (SOAS) to attain his Master's Degree and Ph.D. His doctoral dissertation addressed issues of food self-sufficiency and water politics in the Middle East. In the following article, M. Elhadj explains why, in his opinion, Arab Democracy is a Mirage, and in his conclusion, he comes up with an alternative model, a very debatable one. Click on Read more to access the article. Arab democracy is fantasy. Democratic ideology cannot defeat Islamic theology. Notwithstanding that Arab rule is tribal, corrupt, and mired in favoritism and nepotism it is significant that Arab rulers typically stay in office until death, be it natural or resulting from a military coup. No Arab king or president, however, spares an opportunity, to display the loyalty of his subjects. While the presidents conduct stage-managed referendums in which they consistently manage to achieve near 100% approvals, the monarchs draw mile-long queues of happy-looking men on every national and religious occasion to demonstrate their people’s allegiance. Are such shows indicative of true approval, or devoid of genuine support? Regardless of the contrived appearance of these demonstrations, a degree of real support for Arab rulers does exist. It is impossible to falsify every ballot and force every subject to hail the king. When the presidents of Egypt and Yemen allowed contested presidential elections on September 7, 2005 and September 20, 2006; respectively, the former gained a fifth term with 88.6% of the votes cast, hardly different from his four previous uncontested referendums, and the latter won 77.2% majority, after 28 years of rule. Representative democracy is not a natural choice for most Arabs. Obedience to hierarchical Islamic authority is. In the Arab home, school, mosque, work place, and the nation at large a culture of blind obedience to autocracy prevails. Poverty, illiteracy, and ill health, together with a fatalistic belief in predestination make the masses politically quietist; except for small minorities of Jihadists and Western influenced professional activists, genuine Arab democratic reforms will not evolve for generations, if ever. Curiously, Muslim, but non-Arab countries such as Bangladesh, Indonesia, Pakistan, and Turkey, together representing almost two thirds of world Muslims, conduct democratic elections and allow female prime ministers and presidents. Why is the political persona of the Arab masses quietist? First, the masses fear the security forces. Secondly, the masses worry that change could result in a worse ruler. Thirdly, the influence of Islam is strong on the Arab peoples. The Quran describes them as the “best nation evolved to mankind” (3:110). The Prophet, His Companions, the Quran, and the Sanctuaries in Mecca, Medina, and Jerusalem are all Arabic. Arabs feel they are the guardians of an Arabic religion. Additionally, political frustrations during the past half-century over U.S. policies in the Middle East and Israeli humiliation have been drawing Arabs closer to Islam. Obedience to authority is the hallmark of Islam’s political theory. In the harsh environment of the Arabian Desert, disobedience and strife could waste scarce water and staples. The Prophet Muhammad, a product of desert living, enshrined obedience to authority into the Islamic Creed. In 4:59, the Quran orders: “Obey God and obey God’s messenger and obey those of authority among you.” The Prophet has also reportedly said: “Hear and obey the emir, even if your back is whipped and your property is taken; hear and obey.” Belief in predestination makes tyrannical rulers seem as if they were ordained by God’s will. Many eminent Islamic jurists opine that in the name of societal peace, years of unjust ruler are better that a day of societal strife. Today, Arab rulers exploit Islam to prolong their dictatorships. Egypt’s president and the Saudi king declared on February 24, 2004: “The Western model of democracy does not necessarily fit a region largely driven by Islamic teaching.” Pandering Ulama to Arab kings and presidents preach that obedience to Muslim authority is a form of piety. Fourthly, in the Arab home, poverty drives the father to transform his children into a ‘security blanket’ for old age. Fear of destitution makes the father into what Nobel Laureate Najib Mahfouz calls the “central agent of repression,” constantly threatening his children with the wrath of God if they disobey him. At school, corporal punishment terrorizes students into blind obedience in classrooms. The manager at work, a product of the Arab milieu, demands obsequiousness from subordinates. In the thin Arab labor markets, the employee finds that blind obedience averts financial catastrophe. 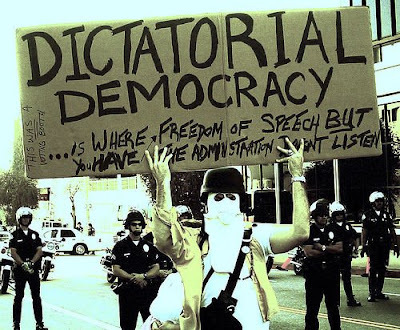 Islamist democracy is no Western democracy. Lately, leaders of the Arab World’s best known Islamist movement, the Muslim Brothers, have been supporting free parliamentary elections. Is Islamist parliamentary democracy consistent with Western democracy? The answer is no. The parliament in an Islamist democracy is not the final authority in lawmaking. Islamist parliamentary democracy superimposes an Islamist constitutional court composed of unelected clerics on top of an elected parliament to ensure that man’s laws comply with God’s laws, a structure similar to Iran’s Council of Guardians. Is the Islamist constitutional court similar to Western constitutional courts? Again, the answer is no. While the former adjudicates according to the Ulama’s interpretation of Sharia law, the latter adjudicates according to parliamentary laws. The failure of Washington’s Arab democratization project Washington has been supporting Arab dictators in order to keep the Islamists at bay. The advances that the Islamists made in every one of the Arab countries that held elections in 2005 and early 2006 at the instigation of the Bush administration indicate that the foray into Arab elections might be over. In the occupied Palestinian territories, the Islamist Hamas won 74 of the 132 seats. Iraq’s January 30, 2005 elections were expedited, if not forced, by the leader of the country’s Shiite majority, Grand Ayatollah Ali Al-Sistani. His candidates won 140 of the 275 parliamentary seats: In the December 15, 2005 elections, they won 128 seats. In Saudi Arabia, the 2005 municipal council elections were theatrics. Women were excluded. One-half of the councilors were government appointed and the councils have no power, merely a local advisory role. In Egypt, members of the banned Muslim Brotherhood stood as independents in the November-December 2005 parliamentary elections. They won 88 seats, or 20% of the parliamentary seats. They could have won more seats, had they been allowed to campaign freely. Finally, the cause of democracy was certainly not enhanced when Colonel Qaddafi, the Libyan dictator, capitulated to U.S. pressure without an ounce of change in his tyrannical rule. The U.S.' “War on Terrorism” has also delayed Arab democratic reforms. Since Arab rulers’ cooperation is needed to eliminate the local Jihadists, Washington cannot seriously pressure its dictator friends to become democrats, because of the fear that democracy could usher more Islamists into city hall. Furthermore, the enormity of the damage inflicted upon Iraq since 2003 by the American occupation in the name of democracy has repelled the Arab masses from democratic reforms. Arab kings and presidents are delighted! Since democratic governance is unlikely to grow in Arab soil, an alternative would be benevolent dictatorship. Except for its non-representative nature, benevolent dictatorship could deliver participatory rule, ensure justice for all, and fight corruption, nepotism, sectarianism and tribalism; thus, defusing the anger that breeds and inflames the Jihadists. How likely is it that benevolent dictatorships might replace Arab rulers’ absolute rule? The answer is that since benevolent dictatorship does not evolve institutionally there is no predictable pattern to discern here. There might be a coup d’état by a benevolent dictator tomorrow; or, there might not be one, ever. You pose a very interesting dilemna for us Arab democrats. But this argument is not new. It has been used in the past in relation to the Middle East but also to the African continent and more recently to the emerging China. As the 'Western' argument goes these civilisations are intrinsically undemocratic due to their cultural, religious and psychosocial view of the role of the individual. But this rather static approach to societies assumes that Western 'Judeo-Christian' societies had the potential for democracy within them. But history does not support this view and the path to democracy in the West until recently has been a bloody struggle lasting hundreds of years(I will spare you the details). Looking back less than a century ago White Europeans were no less deferent to their elders and rulers, their society no less superstitious and patriarchal, Their financial and intellectual proverty no less debilitating. But they achieved a democratic system (which is by no means perfect, but from where we stand it looks like a blessing). As Arabs we have to stop believeing that we are in some way genetically predisposed to live under oppressing regimes. I accept that there is a long way to go, which so far has been bloody and painful but let's stop looking at the past for strategies tha have failed again and again. Every dicatator is enlightened and benevolent in his own eyes. And all our current ones were heroes of some national struggle at some point turning into tyrants at some point in their careers. You are undoubtedly aware that Europe’s modern democratic governance evolved over centuries of religious and political reform, starting with Martin Luthers’ rejection of the authority of the Pope. Rejection of Ulama’s authority in Islam never took place. Muslims, Arabs in particular, continue to suffer the primitiveness and brutality of the Ulama class as supported by their ruler-benefactors. This, in my view is the fundamental reason why Arab democratic rule is a mirage. Like you, Joseph, I believe that as Arabs we are not genetically predisposed to live under oppressive regimes. However, until the control of the ulama is removed, I am afraid that our societies will be condemned to live under tyranny. Witness the spectacular Mu’tazilites who were able to argue in those days that the Quran was created and advocated man’s free will! This period of enlightenment was concurrent with the era of European darkness under a dictatorial church. Release from the ulama’s grip means freeing Muslims from the demagoguery of predestination, fate, superstition, and psychotic explanations of the evil eye and the machinations of angels and djinn. Release from the ulama’s control would lead to evolving Shari’a law with the changing times; above all, instituting modern personal status laws that would abolish Shari’a courts and polygamy and give women legal rights equal to those of Muslim men. This would be a great first step. Tunisia is the only Arab country that has achieved this step. Unless the historicity of the Quran and the Hadith are allowed to be freely examined; rationally and philosophically without the fear of persecution and ulama intimidation genuine Arab religious and democratic reforms will not evolve for generations, if ever. Today, the Arab world needs a combination of a Muslim Martin Luther and a Kemal Ataturk. 1. Regarding the concept of Obedience in Islam : I don’t see Ali bin Abi Taleb, al-Hussein, or in matter of fact “Sakr Koreysh” as “obedient” as u described a “Muslim” should be, moreover in Shiism literature , “3ousyan al-taghiyah”, “thawrat al-ma7roumeen” etc are major leitmotivs in its ideology . 2. I also think that USA & its Allies use Islamism as a scarecrow for the Arabic bourgeois minority & the plutocracy controlling the economy& the vital sectors, and as an alibi to support dictatorships &overlook corruption, therefore, protect their interests in the Region. 3. From Plato’s “philosopher king”, to Voltaire’s “despote éclairé “ that has the merit of reducing the power of the Church, to the “josephinism” of the Austrian Emperor Joseph II incarnated in his notorious "Everything for the people, nothing by the people", or even the “dictablanda (= “soft dictatorship”) in Spain, an “benevolent despot” stays a relative vague debatable concept, especially that the freedom of the individual& the role of the citizenship is at risk;and should the “benevolent despot” accomplish his “mission” in a limited pre-fixed period of time, just like the Roman Dictators did in case Rome was in “great danger” (6 months maximum for the Roman designated patrician, the magister populi, the “master of the people”)? can u give us concrete examples of “enlightened absolutists” of the 20th century, or the 21st? Fidel Castro? Jamal Abdel-Nasser? Finally, I would like to say, dear Dr, that I agree with u that Democracy is not sacred, Democracy is not an aim, but a way to achieve a fair & prosperous socio-political contract (on all levels, financial, cultural, political, artistic, intellectual…), a decent life equally for every human being… Democracy is not a god, democracy is a vehicle, a system, a possibility, and just like any structure, it has its dark side too, as we say in Arabic: “adimoukratiyya laha anyab”, in this case, it becomes a god that devours his children ! 1. You are correct. The Shiite partisans of Ali have been rebellious against the religious and temporal order of Sunnis rulers since the early Islamic state. More than fifty different rebellious sects within Shi’ite Islam may be counted during the two-and-a-half centuries following the death of the Prophet. However, my point relates to the present state of affairs in the Arab World, where the Shiites are a minority of the population in every Arab country except, of course, Iraq and Bahrain where the Shiites are the majority. Of the estimated 300 million Arabs at present around 85%, or 250 million, are Sunni Muslims. About 30 million, or 10%, are Shi’ites. I ought to clarify that the subject obedience referred to in my article is the obedience of the adherents of a specific sect to rulers of their own sect. 2. I agree in what you say that the USA & its Allies use Islamism as a scarecrow; an alibi to support Arab dictatorships. Equally, Arab tyrants, royals and presidents use the threat of Islamism to frighten Washington of the impending disasters to US interests should the Islamists ever reach city hall. In so doing, they hope to monopolize American support to their regimes. Indeed, this frustrating situation has been driving increasing numbers among the Arab masses closer to Islam. 3. Lee Kuan Yew of Singapore comes to mind here. Also, Kemal Ataturk; though, this giant of a leader was a democrat in many ways. If the Obedience u're evoking is an "internal" one, inside the same group, well that's what's Ideology is all abt , the base following, supporting, the summit, or what some prefer to call "Fidelity", "Devotion" etc. Sir, I don’t know if u chose the Singaporean model for its plausible resemblance to the Lebanese case ( the independence of this city-state after Colonialism, the problematic relation with Malaysia: merger with Malaysia, then separation, Lee considering that the real asset of his country being its people…); but u definitely picked the world's longest ever serving Prime Minister (1959-1990) !Yet, u were criticizing nepotism as one of the major obstacles in the Arab World, however, Lee's eldest son became Prime Minister in 2004. P. S : Sir, I just read your highly controversial "The battle for Lebanon"(May 2008), now yr political point of view is more tangible to me, I do agree with yr attack over the corrupted plutocracy, the attempt to eradicate the Resistance…but I also disagree with some yr personal opinions that u chose to verbalize using the a-temporal Present Tense of the Absolute Truth… moreover, u totally silenced Lebanon's existence when u limited the debate between what Saudi's aspire to and what the Syrians want … As for yr "closure", i.e. , yr final phrase, Dr, it was very provocative for a Lebanese citizen to read it. I suggest the following link for a very interesting speech relevant to this discussion by Professor Benjamin Barber given recently in Istanbul (appropriately enough, given the references to Mustafa Kemal!). I am not necessarily endorsing the contents of the talk, but just found an excellent read.